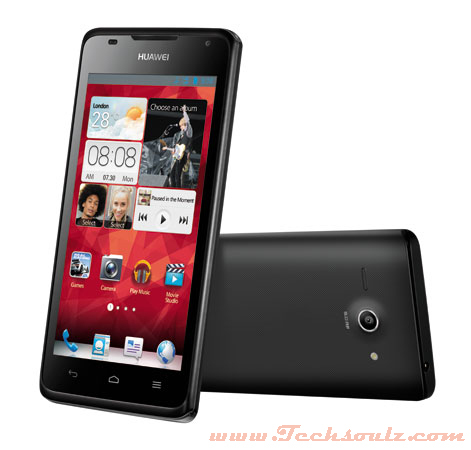 Huawei’s Ascend G510 doesn’t look all that great and is similar to many other Android smart phones in the market. Its 4.5-inch capacitive display is a fingerprint magnet. There is Huawei’s branding on the top with three capacitive touch keys below the display. A 3.5-mm headphone jack is placed on the top with the lock control, volume control and charging jack on the left panel. The black textured plastic back isn’t impressive either. Huawei has done away with the stock Android interface by loading its own Emotion UI. So, the phone doesn’t have an app launcher tray anymore. Instead, all apps are placed on the homescreen, which gets a bit difficult to navigate through. The only respite is the five icons that can be docked at the bottom, which remains static across the nine homescreens. Instead of enhancing the experience, Emotion UI has spoiled it further. We noticed a lag while navigating through the home-screens or launching apps. A third-party launcher did not bring in any difference in terms of performance. This despite the dual-core processor. The performance is shockingly slow and the Quadrant score of the Huawei G510 was 2451. The only positive was the smooth browsing experience over the high speed Wi-Fi network. The Huawei G510 failed to impress us in the camera department as well. It has got a 5 MP camera onboard. At first, the images captured looked decent. However, when the images were transferred to a PC, we noticed a lot of distortion and lack of clarity. Even on full brightness, the display isn’t good enough to enjoy videos or movies. The sound output is just about average. The smartphone packs in a 1700 mAh battery that managed to hold the charge for a day with very limited use.